Transpontine: Supermarket Self-Checkout - is scanning kind of scabbing? Supermarket Self-Checkout - is scanning kind of scabbing? Always been a Marc Almond fan musically, and I think we can claim a bit of him for South London as he lived around the Bermondsey Street area for quite a while (not sure he still does). In fact he's just about to release an exciting-sounding London-themed album 'The Tyburn Tree' with John Harle, which I'm looking forward to hearing. 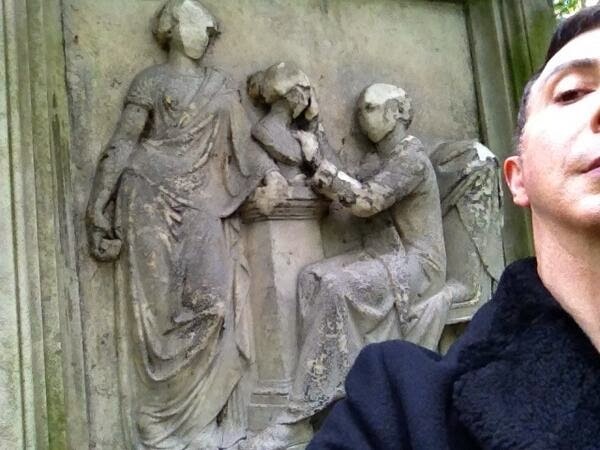 The publicity shots were done in Nunhead Cemetery. Recently I started following him on twitter, and last week he posted on a subject dear to my heart - the proliferation of 'self-checkouts' in supermarkets. As Marc expressed it 'I will NOT use self-checkouts and I will not be forced to. They take jobs'. Of course he is right, the more people can be persuaded/pressured to use self-checkouts, the less people will be needed to work on the tills. It's not actually 'scabbing', they're not on strike after all, and shoppers don't always have much of a choice if there are huge queues for the few staffed tills. But when you do it yourself you are doing the work that somebody used to be paid to do. But it's not only that. Self-checkouts also mean worse working conditions for those doing the jobs remaining. Instead of sitting at the till, more supermarket staff now spend the day on their feet frantically directing customers to self-checkouts as they become available. So the remaining jobs will become less accessible to older and physically disabled workers. Finally there is the loss of the everyday human contact, all those short conversations and acknowledgements at the checkout. It feels as if supermarkets want to eradicate all 'surplus' encounters other than the naked business of paying. With big supermarkets seemingly superseding churches as the places where the greatest cross section of the community come together every weekend, any loss of genuine human interaction is to be regretted and resisted, as is the loss of opportunities for local people to make some kind of a living from the huge amounts of money passing through these stores. So if you see Marc Almond having a strop in a supermarket near you, give him your full support! Remember the 60s when every future tech programme (Tomorrow’s World especially) would showcase some gadget or other that would bring ever closer the vision of a Keynesian Leisure Society and the 15 hour week for all? Failing that Hazel O’Connor and the Eighth Day. Now, in the United Kingdom, we can opt out of the 48-hour working week and work even longer hours and complain if machinery “takes jobs”. Then that has been argued down the years for so many tools of our modern leisure, televisions destroying the cinema and theatres, home brew kits destroying pubs, cars put osiers put of work.